 An inspiring story of an African-American double amputee aviator whose triumphs will impress even the most cynical and jaded of readers. Neal Loving never met an obstacle that he couldn't overcome. In this memoir, he describes in astounding detail his journey through the racially discriminatory world of aviation in the 1930s, a crippling glider accident in 1944, and life as a successful aviation educator and engineer. 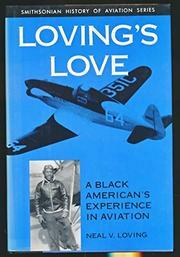 Born in Detroit in 1916 to a middle-class African-American family, Loving early developed a fondess for aviation. Though discouraged from trying to break through the prevailing prejudices, he forged ahead and became one of several African-Americans aviators. In 1944, he lost both of his legs in a glider accident that laid him up in a hospital for several months. Simultaneously, his fiancÇe left him and his mother died. On artificial legs, he rebuilt his life and took once again to the air. By the end of the story, he has successfully designed and built his own aircraft, the Love, opened an aviation school, married a woman from Jamaica, become an aeronautical engineer, and worked at the highest levels of aviation safety. Throughout, Loving limns the challenges of both de facto and de jure segregation and paints portraits of the many people who defied those obstacles to become successful pilots. Written in unadorned, straightforward prose, this memoir is a testament to human fortitude, courage, and joy.